Russian Talmudist; born at Wilna in 1797; died there in 1881. Eliezer officiated as rabbi of the communities of Woronowo, Padzelwe, and Eishishuk, succeeding his father as dayyan of Wilna at the age of twenty-nine, and remaining in that office until his death. As dayyan he was noted for his endeavors to lighten the burden imposed by the ritual, while he himself lived a life of asceticism. Russian rabbi and Talmudist; flourished in the eighteenth and nineteenth centuries; died at Jerusalem Feb., 1858. 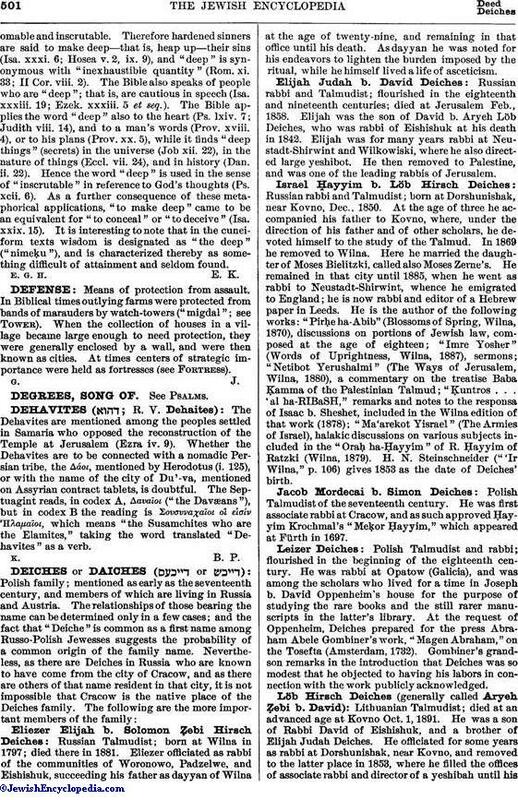 Elijah was the son of David b. Aryeh Löb Deiches, who was rabbi of Eishishuk at his death in 1842. Elijah was for many years rabbi at Neustadt-Shirwint and Wilkowiski, where he also directed large yeshibot. He then removed to Palestine, and was one of the leading rabbis of Jerusalem. Russian rabbi and Talmudist; born at Dorshunishak, near Kovno, Dec., 1850. At the age of three he accompanied his father to Kovno, where, under the direction of his father and of other scholars, he devoted himself to the study of the Talmud. In 1869 he removed to Wilna. Here he married the daughter of Moses Bielitzki, called also Moses Zerne's. He remained in that city until 1885, when he went as rabbi to Neustadt-Shirwint, whence he emigrated to England; he is now rabbi and editor of a Hebrew paper in Leeds. He is the author of the following works: "Pirḥe ha-Abib" (Blossoms of Spring, Wilna, 1870), discussions on portions of Jewish law, composed at the age of eighteen; "Imre Yosher" (Words of Uprightness, Wilna, 1887), sermons; "Netibot Yerushalmi" (The Ways of Jerusalem, Wilna, 1880), a commentary on the treatise Baba Ḳamma of the Palestinian Talmud; "Ḳuntros . . . al ha-RIBaSH," remarks and notes to the responsa of Isaac b. Sheshet, included in the Wilna edition of that work (1878); "Ma'arekot Yisrael" (The Armies of Israel), halakic discussions on various subjects included in the "Oraḥ ha-Ḥayyim" of R. Ḥayyim of Ratzki (Wilna, 1879). H. N. Steinschneider ("'Ir Wilna," p. 106) gives 1853 as the date of Deiches' birth. Polish Talmudist of the seventeenth century. He was first associate rabbi at Cracow, and as such approved Ḥayyim, Krochmal's "Meḳor Ḥayyim," which appeared at Fürth in 1697. Polish Talmudist and rabbi; flourished in the beginning of the eighteenth century. He was rabbi at Opatow (Galicia), and was among the scholars who lived for a time in Joseph b. David Oppenheim's house for the purpose of studying the rare books and the still rarer manuscripts in the latter's library. At the request of Oppenheim, Deiches prepared for the press Abraham Abele Gombiner's work, "Magen Abraham," on the Tosefta (Amsterdam, 1732). Gombiner's grandson remarks in the introduction that Deiches was so modest that he objected to having his labors in connection with the work publicly acknowledged. Lithuanian Talmudist; died at an advanced age at Kovno Oct. 1, 1891. He was a son of Rabbi David of Eishishuk, and a brother of Elijah Judah Deiches. He officiated for some years as rabbi at Dorshunishak, near Kovno, and removed to the latter place in 1853, where he filled the offices of associate rabbi and director of a yeshibah until hisdeath. He is the author of "Zibḥe Teru'ah," a commentary on the prayers of New-Year's Day (Wilna, 1867). Lithuanian rabbi; died at Wilna March 23, 1825. His father was rabbi at Lida, near Wilna; his grandfather, called Elijah Arkes ("Arke" is the diminutive of "Aaron"), was a native of Cracow. On his mother's side he was a nephew of the dayyan of Wilna—"the great Simeon." Like the latter he was for many years one of the dayyanim of Wilna, and was famous for his devotion to the study of the Talmud. Many of the works printed at Wilna during his term of office bear his printed approbation. 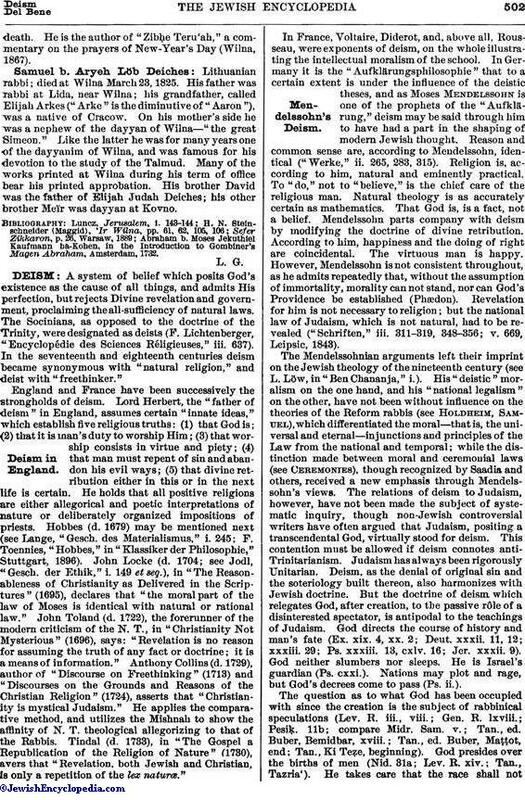 His brother David was the father of Elijah Judah Deiches; his other brother Meïr was dayyan at Kovno. Abraham b. Moses Jekuthiel Kaufmann ha-Kohen, in the Introduction to Gombiner's Magen Abraham, Amsterdam, 1732.